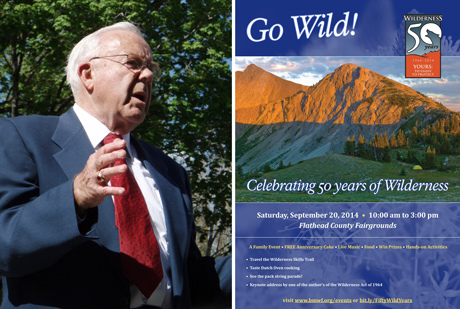 UPDATE: In a related matter, click here for a PDF summary of Keith Hammer’s 9/12/14 presentation to the Maureen and Mike Mansfield Center’s Wilderness 50 Conference. Today we mark the 50th Anniversary of the Wilderness Act, but mark your calendars for September 20 and join us in a big celebration of it at the Flathead County Fairgrounds! Come meet and be encouraged by Stewart Brandborg (above), who worked for eight years alongside Howard Zahniser to pass the Wilderness Act on September 3, 1964! This foresighted Act initially designated 9.1 million acres of public lands as Wilderness, including the Bob Marshall Wilderness, and in the hands of hard working citizens has since brought the total to nearly 110 million acres. But many of America’s wildest public lands remain at risk of development and the “expanding settlement and growing mechanization” foreseen by the Wilderness Act. We look forward to Brandborg’s words urging all of us to keep up the good fight! Click here for our short biography of Stewart Brandborg. Click here for the Missoulian’s more detailed accounting of Brandborg’s efforts to pass the Wilderness Act. Click here or see below for the Flathead’s Wilderness 50 Celebration agenda!